So it seems I’ve been a very bad blogger lately! I find myself wearing several hats (pun intended) lately and starting up my new little business has lots of my energy going away from this blog. Sorry! I’m still here! 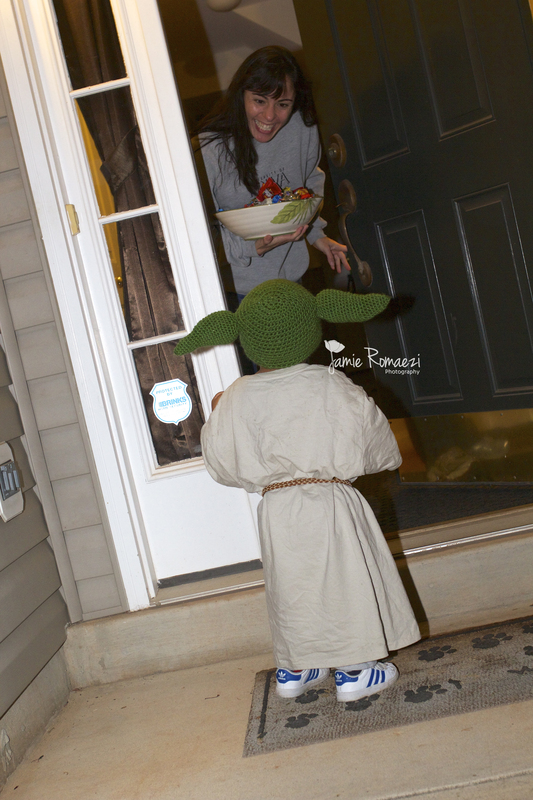 So this Halloween was Kamran’s first true time trick or treating. He had an absolute ball–so did my husband and I! 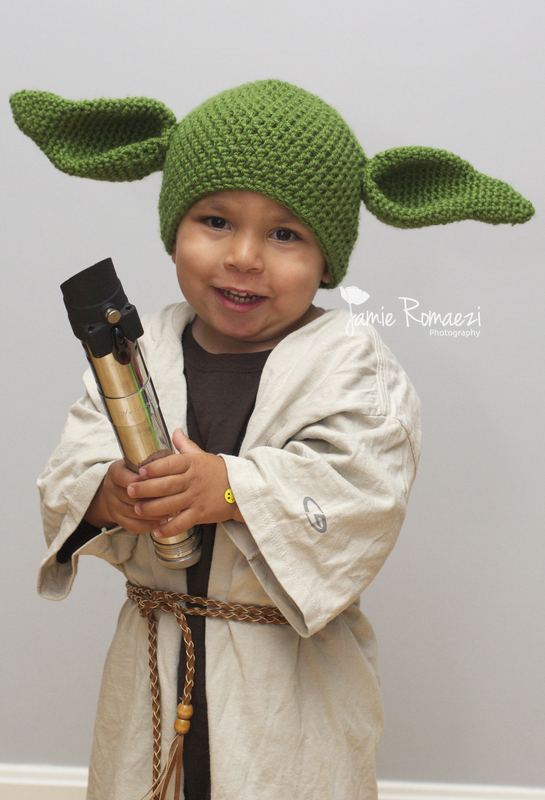 Little guy dressed up as Yoda in a costume made by yours truly. 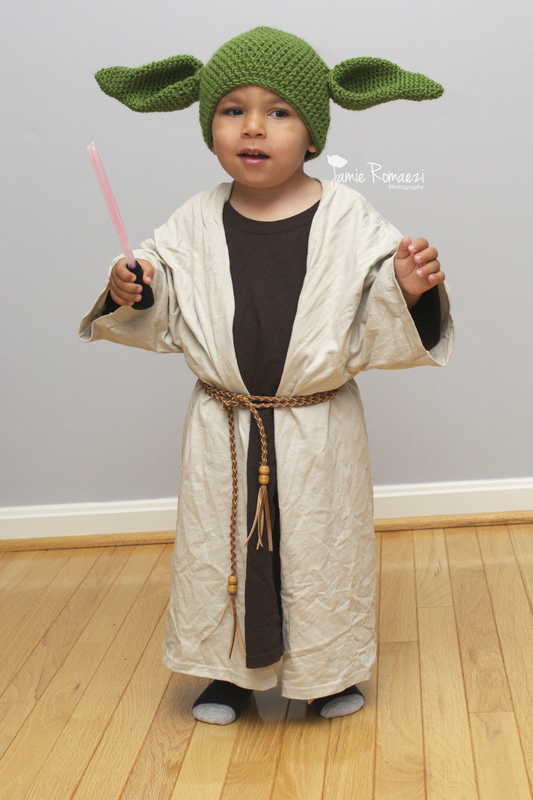 He spent a good few days practicing his light saber sounds and breaking in his Yoda hat. One thing little man said quite a lot tonight was “Hi Ms. Ya-yen! Tank ew Ms. Ya-yen!” As he helped himself to **more** candy from the neighbor’s dish. (Don’t worry, the candy is for ME, not him–he gets raisins and organic lolipops.) In addition to candy, he also took “Ms. Ya-yen’s” nose. Don’t worry, he gave her his in return. Two is honestly my favorite age so far. I have to share this costume and how I made it because it was probably one of the easiest things I’ve ever made. To make this costume you need 3 real skills. You *do* need to know how to crochet and make the hat. (Or you could just order one from me www.facebook.com/loopsidaisy) The other two skills are fairly easy–cutting and hot glue. Green yarn for the hat. 2 medium sized mens t-shirts. One brown and one tan. 3 glow sticks, preferably green–we didn’t have green. I typically don’t use patterns for my crochet work. I wanted to get this hat done quickly so I opted to use a pattern. This pattern from Knot Your Nana’s Crochet. It took me a day-ish of working on it as I had a minute. I crochet rather fast, so perhaps give yourself and extra day if you think you need it. For the robes. The men’s brown shirt is the base. Just put it on your child. The tan shirt should be cut up the front and center so it opens like a robe. I just eyeballed it. You could hem this (sewing or adhesive, iron on hem tape) if you want, I just tucked the raw edges under once it was on my little guy. I just happened to have the perfect belt for my little dude to borrow. If you don’t have one, tan colored rope or twine would work just fine. It wrapped around his waist twice and had plenty of room for the ends to hang once tied. You see 2 light sabers in the photos above. The big one is a geek-item belonging to my husband. Little dude actually walked around the neighborhood with 3 glow sticks, hot glued together. The handle is just black electric tape wrapped on itself.